Thermal flow switches are sensors with an electrical contact output at a specific flow rate. 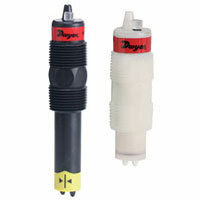 Dwyer models provide a complete system for leak detection and feature a selectable NO or NC operation. Applications include chillers, hot water heaters, and liquid transfer systems. Thermal Dispersion Flow Switch offers solid state flow detection of non-coating liquids for pump and process protection. Features a selectable NO or NC operation. Thermal Dispersion Flow Switch uses impulse thermal dispersion measurement. Indicates if flow rate is under or above a user set flow rate. Applications include hot water heaters, chillers, and liquid transfer systems.